I stood in my kitchen yesterday evening sucking watermelon to the rind. I ate greedily, letting the juice dribble down my chin and onto my shirt. When I was finished, I threw the shirt into the garbage bin, not because of the juice, but because a child's bracelet had snagged it at work earlier in the day and ripped a small hole near the bottom hem. It was one of my favorite shirts; soft, well-loved. But, for those same reasons, I was okay letting it go. It had a good run. 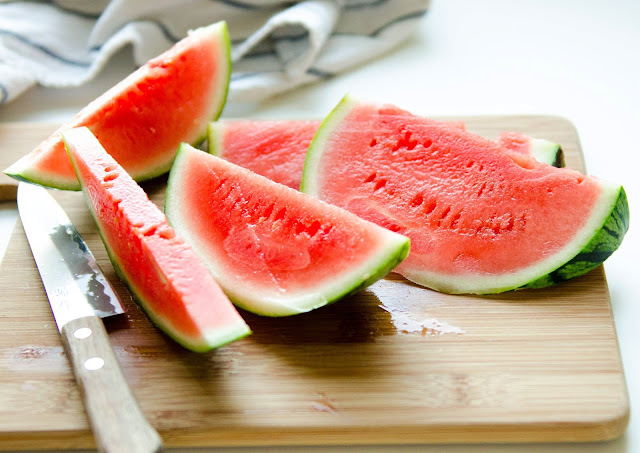 I'm not really sure why I'm waxing lyrical over watermelon and old clothing: it likely has to do with the fact that the school year ends next Wednesday and I'm experiencing all of the feelings. I think we'll have a watermelon snack on the playground next week. It's the right thing to do when you only have a few days left with the twenty-five little humans who've been the bread & butter of your life for the past ten months. This post is so visceral and gorgeous–I love it. And the cantaloupe and prosciutto John and I ate greedily last night (and this morning). And they will miss you!! !